Three’s the charm--save 25% with Stacey Joy Netzel’s Boxed Set of three romances! Best of all, the Boxed Set has something for everyone...a paranormal ghost story, a high school reunion story told in a she said/he said format, and a Christmas story all about the spirit of giving. 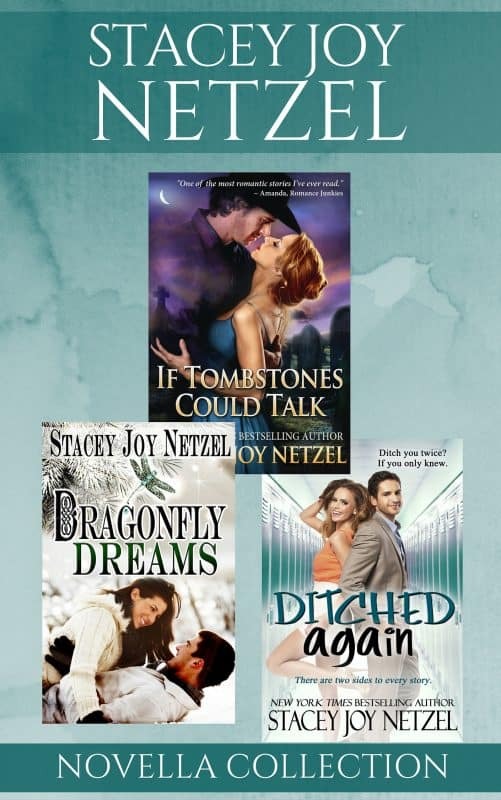 Three’s the charm–save 25% with Stacey Joy Netzel’s Boxed Set of three romances! Best of all, the Boxed Set has something for everyone…a paranormal ghost story, a high school reunion story told in a she said/he said format, and a Christmas story all about the spirit of giving. Had someone asked Melanie Sparks if she believed in ghosts, she’d have laughed before voicing an emphatic “No.” Then she takes a walking tour of the cemetery in her new hometown of Lindeman’s Crossing, Colorado and meets one of the residents face to face. The story behind Andrew Lindeman’s tragic death after the Pike’s Peak Gold Rush in 1859 triggers dreams in which she relives his last moments. Drawn to the handsome ghost, attraction builds, and she resolves to clear his tarnished name. A passionate kiss sets his spirit free, but will Melanie lose her heart forever? Can a family connection to the ill-fated Titanic bring new hope to sinking dreams? With his antique shop on the brink of bankruptcy, Jake Coburn knows he shouldn’t buy costume jewelry at a price that won’t turn a profit. Then again, it’s Christmas, and he hasn’t been able to say no to Loral Evan’s since the first time she entered his shop. Desperation is what drives Loral Evans to sell precious family heirlooms, but Jake’s offer of one thousand dollars for a dragonfly brooch she knows is fake stings her pride. If only she could afford to walk away from the handsome antique dealer. During a season of giving, Loral learns there’s a big difference between pride and dignity, and Jake’s determination to do the right thing brings rewards beyond what either of them ever dreamed of. Pick up your copy today and enjoy all three for a 25% savings.